All the territories to the north and west of the provinces of Quebec and Ontario were known as Rupert's Land. This was a vast area of wilderness and resources that stretched from the 49th parallel to the Arctic Circle and included all the land whose rivers drained into Hudson Bay. For 200 years the Hudson's Bay Company had held an exclusive trade monopoly in the area granted by its charter from England. 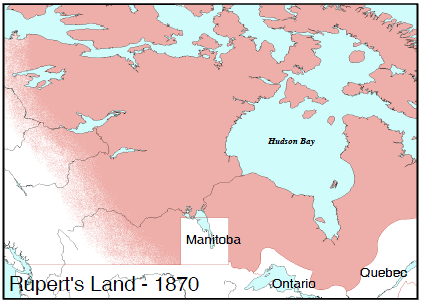 Soon after Confederation the new Canadian government began negotiating with the Hudson's Bay Company to add Rupert's Land to its territory. With increased industrialization and development in Canada West, good agricultural land was becoming scarce and expensive. Settlers began looking farther west to the rich lands of the Red River Valley for farming opportunities. At the same time American expansion was threatening to move up the valley and also, the Fathers of Confederation needed jurisdiction over the territory in order to go ahead with their plans for a transcontinental railway. An agreement was reached on November 19, 1869 and the land was officially transferred on June 23, 1870. Under the terms of the agreement, negotiated for Canada by George-Étienne Cartier, the Hudson's Bay Company received 300,000 British pounds or about $1,500,000, and was allowed to keep one-twentieth of the prairie farmlands or about 2.8 million hectares for itself. It continued to trade in the area, but it was relieved of the burden of administering law and order, a task which would be taken up by the new North-West Mounted Police.